Debonair, charismatic British actor Patrick McGoohan asked those questions in the 1960s during a visit to Portmeirion Village in Wales. The result was The Prisoner, an iconic miniseries that remains a cult favorite. It’s not surprising that Portmeirion inspired a classic. 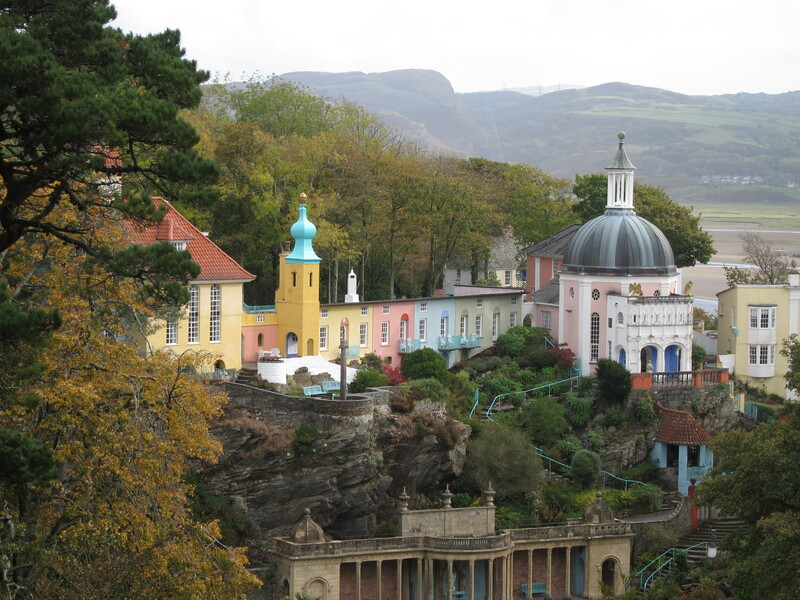 Sitting on the edge of an estuary, Portmeirion has the look and feel of a hillside Italian village in miniature. Upon seeing it for the first time, I let out an involuntary gasp at the stunning, elegant buildings and the abundant nature surrounding them. Portmeirion was the brainchild of Clough Williams-Ellis, who asked himself, what if he could create beauty without disturbing the surrounding environment? He spent 50 years working on the answer. What if? It’s my favorite question. Sometimes “what if” paralyzes me with fear when I’m trying something new and fear the worst. “What if” helps me plan ahead and solve problems before they happen. “What if” ponders my fate had I made different choices as a young woman. As a writer, I rely on “what if” to come up with story ideas. What if an ambitious female money manager gets caught up in the Madoff scandal and loses the life she knew? What if a troubled young woman with low self-esteem and a burgeoning alcohol problem is the only person who can stop a dangerous bully? What if my great-great grandmother, the one who bore a child out of wedlock and died ten months later of typhoid, was not the victim her story would suggest? “What if” brought me to Wales. When we decided to visit the U.K., I said, “What if I ask Juliet Greenwood, a Welsh author I met online, if she wants to meet in person?” I did ask, and she said yes. 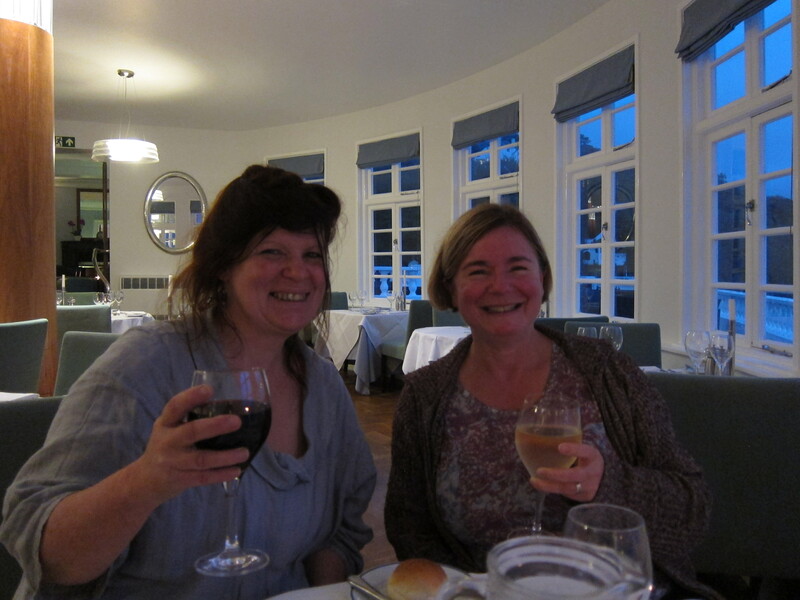 We met first in her home, then she joined us later to relax in Portmeirion. Juliet recently wrote about her visit here. As you will see, she gathered some incredible nighttime photos! Juliet is one of those writers for whom I have great respect. She works hard at her craft and has created two lovely novels, Eden’s Garden and We That Are Left. 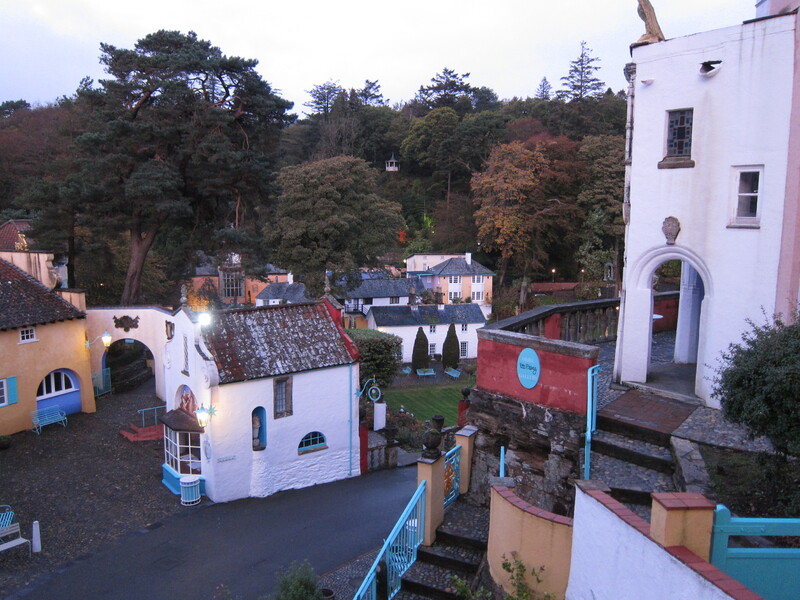 Getting to know her better in person in Portmeirion made the experience that more magical. What if I worked as hard to build my stories and skills as Juliet does? Hmm. Something to think about. Thanks to my friend Tina Fariss Barbour of Bringing Along OCD, I have hooked up with Nancy’s A Rural Journal for Random Five Friday. Don’t know what I’m getting into yet, but I’ll see how it goes! I invite you to visit these blogs and participate in Nancy’s Random 5 if you so choose. It’s been a great harvest week for the garden. Blueberries, onions, artichokes, and lots of tomatoes! I’ve had a bumper crop of peas and have frozen several batches, but they’re just about done for the year. The pumpkins are blooming and zucchinis are forming. I volunteer at the office of our local public theatre, Key City Public Theatre. We’ve had a hectic week, selling lots of tickets to a musical history of the world, The Big Bang, and getting ready for Shakespeare in the Park. My husband is an actor who will be performing in Much Ado About Nothing. I didn’t write a regular blog post this week. Well, actually I wrote several, but nothing feels ready for prime time. Bear with me. I’m hoping that by doing this Random 5, I’ll get back to a regular routine, including book reviews and blog recommendations. My latest novel concerns a Manhattan-based financial planner who gets unwittingly swept up in the Madoff scandal. At the same time, her estranged aunt has died and left her a house on *cough* the Olympic Peninsula. Soon I plan to start sharing my draft with you. I’ve learned that it’s impossible to predict the weather here on the Peninsula. When we lived in Houston, we would not only know that a storm was headed our way, but we would know when it would arrive. Here, the forecasts are useless. The other day we had a predicted high of 81, but it hit 63. There was no rain in the forecast, but my deck was wet this morning. Go figure.